I love to create sensory bins related to holidays. With toddlers and preschoolers in the house, sensory bins give us many great opportunities for play and learning. 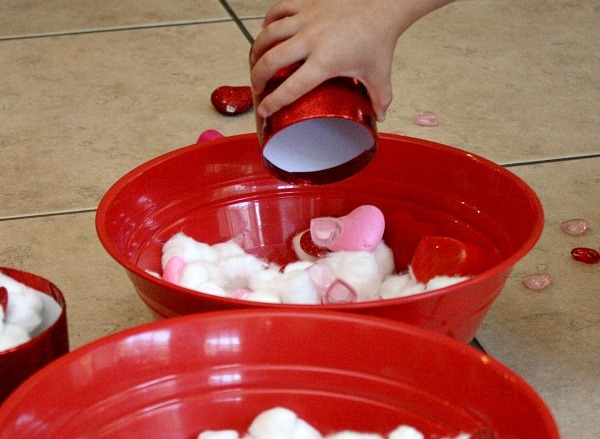 This valentine sensory bin is made from materials you can pick up at the Dollar Tree. 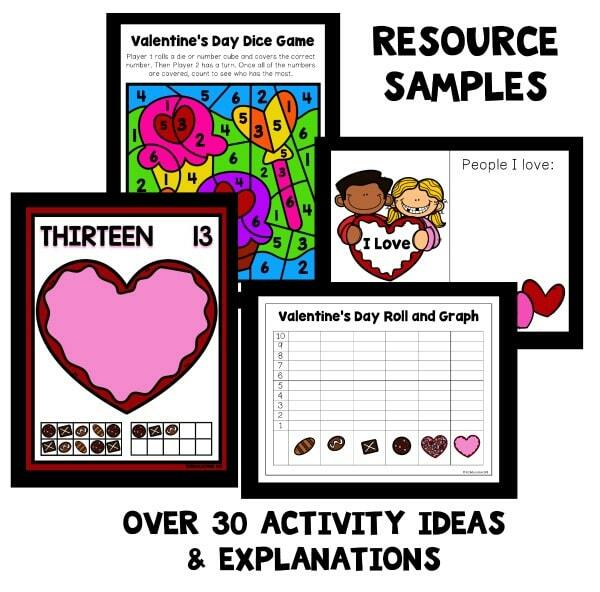 Here are the details of what’s inside and ways you can use the materials to extend learning. I used two large red bowls for the sensory bin containers. The kids loved being able to transfer materials last year for our St. Patrick’s Day sensory bin, so I knew they’d enjoy having two separate containers. 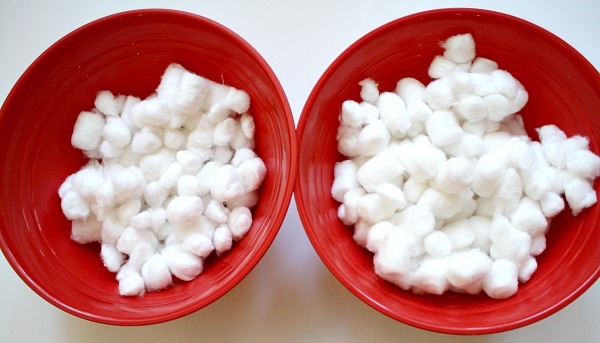 For the sensory bin base I used cotton balls. They provide a nice soft texture for the toddlers to explore. Then we added a mixture of red and pink items from the Dollar Tree. 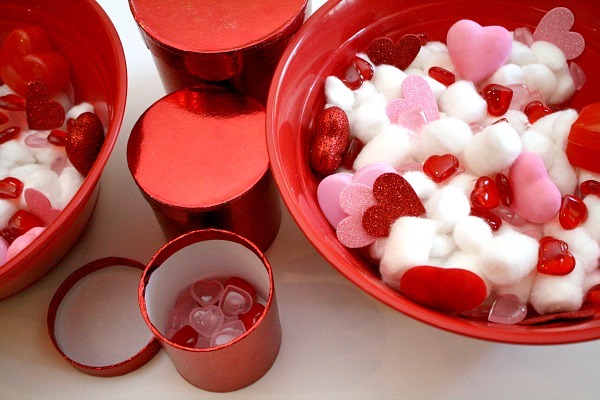 We used pink and red heart gems, small heart-shaped plastic boxes, glittery table scatter foam hearts, and the hearts pulled off of heart picks. When I set up the invitation to play I also included three red canisters in different sizes. 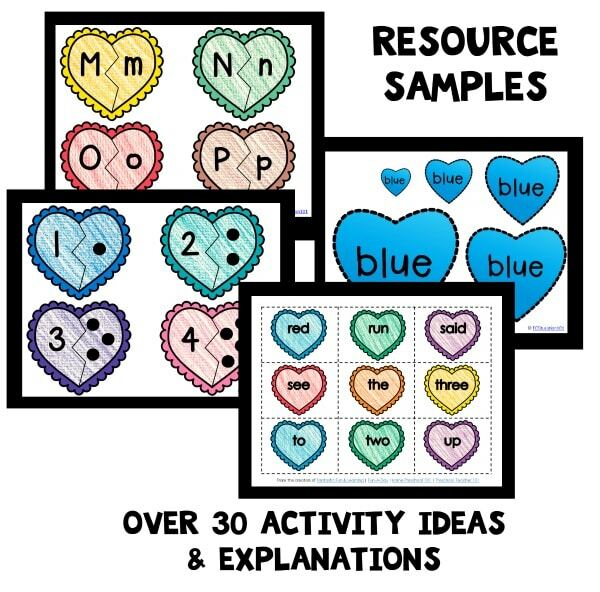 I thought they would be good for both pretend play and learning activities. 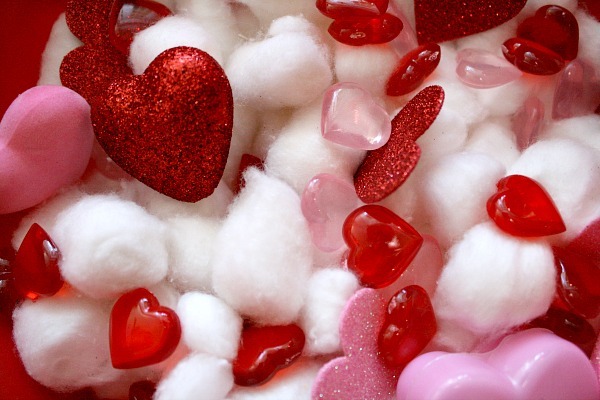 Starting this bin a while before Valentine’s Day will give us many opportunities to use it in different ways. First I will simply leave the bin out for the kids to explore on their own. This self-directed learning and sensory exploration is the primary focus of sensory bins. The kids will feel the different textures, observe the objects, and begin to experiment with the materials in different ways. During this time I will also watch to see what they are naturally doing with the objects so I can decide which activities we might do next. 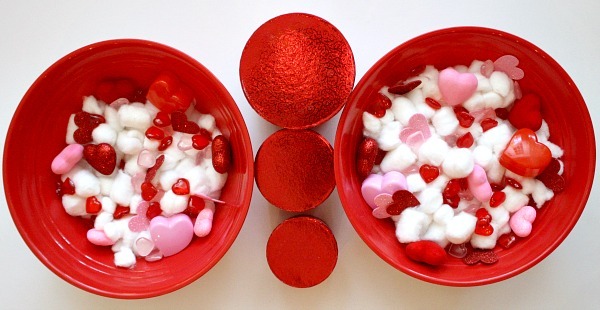 So far the girls have been making a lot of valentine soup using the canisters. They’ve also started their own candy shop making little chocolates for customers using the small hearts and plastic heart boxes. Once I see that the kids are done freely exploring the bin, I will start using some of the options below for extending its use. These are more adult-directed than free exploration, but they will allow us to focus on specific skills. The bin will also remain out and available for free exploration. Talk…just talk about what the kids are doing as they explore the bin. This can be a great way to introduce and discuss new vocabulary. Describe what little ones are doing. Ask older children to describe what they are doing in their own words. Name objects in the bin. Discuss and explore the texture of different objects in the bin. Play “I Spy” by describing an object using its physical description (color, shape, size, texture). Practice fine motor skills by moving small pieces from one bin to the next. Toddlers can use their fingers in pincer grasp, or you could include tongs. Pour items from one container to the next. This is a toddler favorite! Discuss capacity and identify whether the canisters are full or empty. Count how many cotton balls it takes to fill each canister. Compare the amounts. 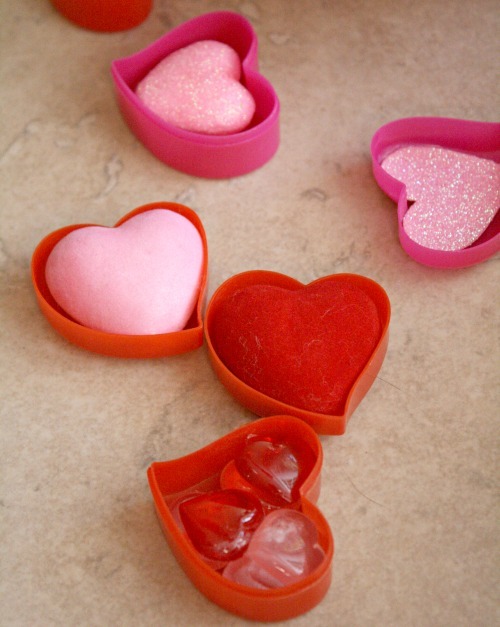 Count how many hearts gems it takes to fill each canister lid. Compare the amounts. What other learning activities would you use to extend the use of this sensory bin? 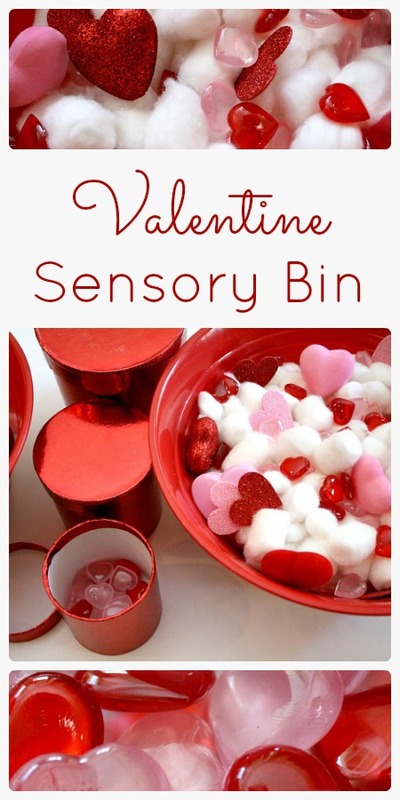 Thank you for sharing this sensory bin idea. I set it up this morning for my son and it was a huge hit! And so easy too. Easy and fun are definitely a plus! I’m so glad your son enjoyed the bin, Christina! What a fun sensory bin! My kids would love this. 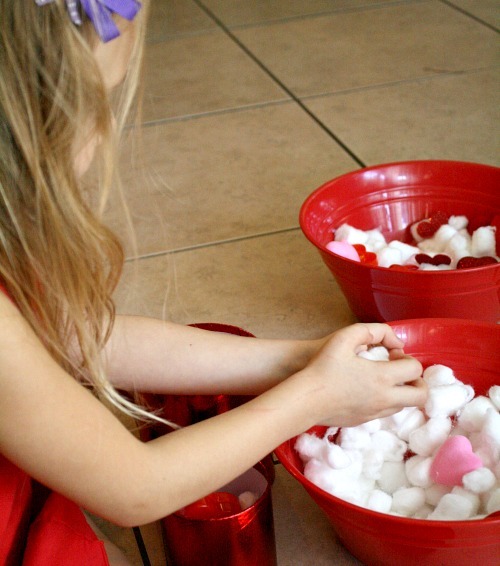 Always such adorable activities, I love this sensory bin so much! Wondering how frequently you offer the bin to your children? I keep the bin out in an accessible area for the kids to choose on their own. That way they can explore it at their leisure. But I may draw specific attention to it with a learning activity once a day or every other day for a couple of weeks until the kids seem to start losing interest. Your sensory bin looks so beautiful. The beautiful photos almost make me want to eat it! I bet your girls had such fun with this bin that is a real treat for the visual sense!